And the Beet goes on……..
A couple of weeks ago, I went to a local cafe for dinner. On the menu was a Winter Harvest Salad. The description of the salad was roasted winter vegetables (turnip, beets, potatoes and others I can’t recall) over greens with walnuts and feta cheese served with a balsamic dressing. Wait.. roasted beets, turnips? I’ve never had that… so I was SOLD. I won’t go into how long it took to get our food or how not all the veggies described were on my salad…., but I will say it was so good and a great idea.. simple and delicious. So much so that I decided to make it myself at home, but change it up a bit. I didn’t take pictures of all the steps, but I have a couple to share below. I cut up the following veggies in about 1 inch pieces: red and sweet potatoes, sweet onion, red pepper, fresh beets, mushrooms, carrots, summer squash and zucchini…… all in a big bowl, cuz there were lots of veggies that I planned on saving for a few meals. Toss with a little salt, pepper and olive oil so that they are coated. Note: I couldn’t find turnips on my shopping trip. and I always lay release aluminium foil (your best friend) on the bottom of my pans when I cook messy stuff in the oven. Ok.. so..oven is preheated to 425 degrees. Let them roast for about an hour but give them a stir about 3 or 4 times during the hour. I wanted mine to be really done and golden, almost carmelized. If you like them al dente, then adjust your timing. In the meantime, I had a large fennel bulb to do something with. I had never experienced fresh fennel before. I see all the chefs cooking with it in fresh salads or sauteing it (I am a FoodTV Network, freak by the way). I tried a raw piece of the fennel and I did not like it at all. So, I decided to slice it up and saute it with a little olive oil and garlic. Much better taste. I basically carmelized it to make it sweet. Once everything was cooked, I created my salad…. 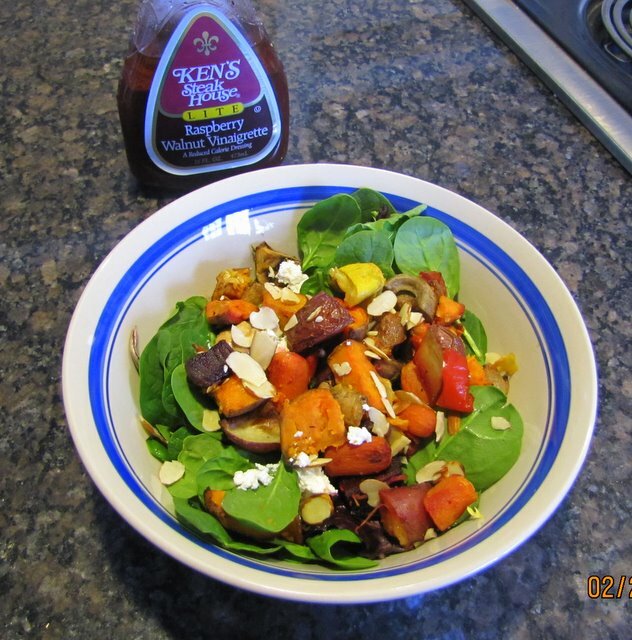 Greens and baby spinach in a bowl topped with the roasted veggies, sliced almonds, and farmer’s cheese. I didn’t have walnuts or feta, but these worked great as substitutes… fresh mozzarella would be great too. I topped it off with Raspberry Walnut Vinaigrette dressing; just a little to not drown the taste of the veggies. I am in love with this salad… and roasted beets? …. oh man.. hello? I never would have thought to use them. And.. my opinion?… it was better than the cafe’s salad. I can’t wait til summer to make this using fresh produce from the local farmer’s market. You can take these veggies and use them in many ways.. Remember my grilled veggie post? Well, same idea…. and my grilled pizza post… they can easily go on the pizzas. 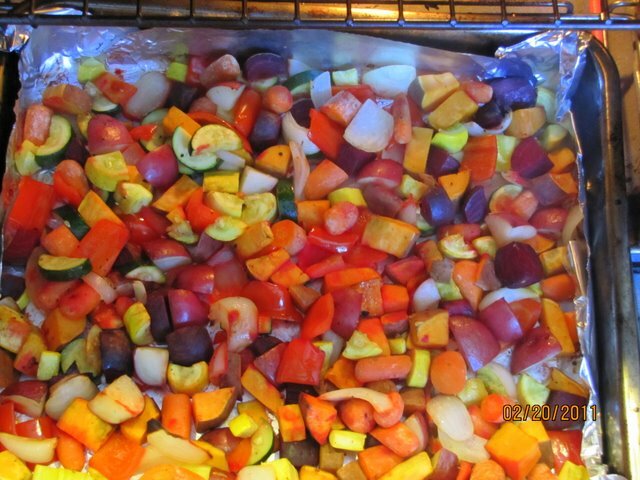 Or even if you have a take out pizza, top it with these veggies and put under the broiler for a minute. Make a sandwich wrap or a panini. Put them on top of pasta or in an omelette… but whatever you choose to do with them.. enjoy this luscious taste and how healthy they really are… it’s a win win people.